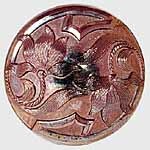 These are some of the less common, though not necessarily valuable, hatpins that come up for auction or are found in private collections. There are many more that have not been photographed or any sales information. Banded Berry Cluster. 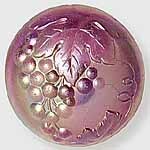 This pattern is also known by several other names including Grape Cluster. Found mostly in lavender. One sold in 2010 for $135, another in 2011 for $90. Banded Criss Cross or just Criss Cross. In purple, one sold in 2012 for $110, another in 2014 for $90. 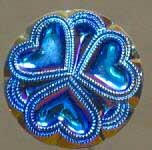 Beaded Clover. 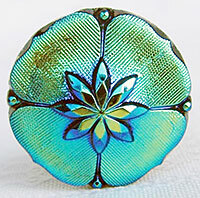 This pretty hatpin is in the collection of Carl and Eunice Booker. 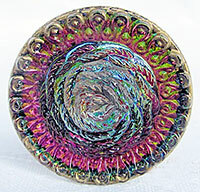 Beaded Pinwheel. Also in the collection of Carl and Eunice Booker. One sold in 2011 for $160. 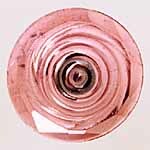 Beaded Spiral. Yet another in the collection of Carl and Eunice Booker. Bee on Flower. 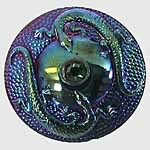 Known only in dark or purple glass, two sold in 1995 and 1997 for $600 each. Bird of Paradise. 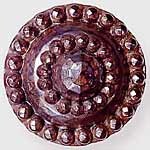 An exotic and very desirable hatpin. One sold for $2,000 in 2001. Border Path variant. Similar to Border Path shown on the common hatpin page. One sold in 2007 for $125. Bubbles. This one sold for $450 in 1995. Another one sold in 2001 with damage for $35 (but was bid up to $80 before the damage was found). Cane. 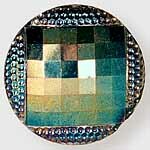 This example was photographed while in a private collection. The only sale I reported was for $325 in 2001. Cherries. Quite scarce and very desirable. Most recently sold in 2011 for $350 and 20113 for $300. Circle Delight. In purple, this one sold at a Tom Burns auction in 2014 for $100, along with a similar one for $135. Concentric Circles. 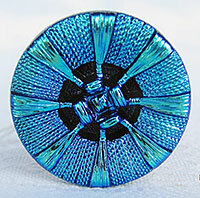 These are said not to be iridized. 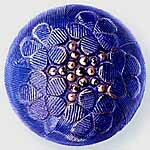 This one, in lavender, sold at a 1995 auction for $185. On eBay in 2005, one brought $194. In 2006, an amber brought $225. And in 2007, one in green sold for $30. Daybreak. 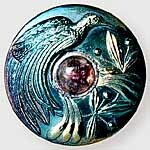 Similar to Sun's Up (see common hatpins), but smaller. Sold in 2003 for $500. Only one I've heard of. Diamond and Oval. 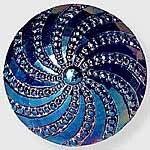 This pattern has a diamond superimposed over an oval base. It's in a private collection. Dinner Ring. 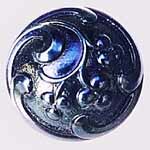 Named after a similar button pattern. This one brought $550 in 2003 though another brought just $155 the same year. One sold for $100 in 2011. Dots and Panels (not sure about this name). 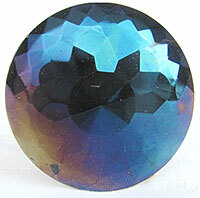 Dark with beautiful blue iridescense. Sold for $105 in 2014. Double Crown. 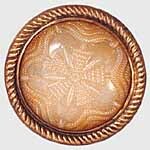 These brownish hatpins are worth $40 to $60. 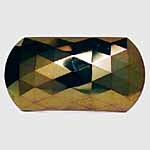 Faceted Butterfly. One of these sold for $400 in 1996, another for $475 in 2003. In 2009, an example brought $300. 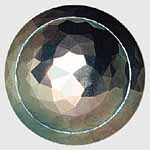 Faceted Circle. This one sold in 2014 for $45. Fancy Beetle. Highly desirable. One sold for $450 in 1995, another for $350 in 1997, a third for $1,000 in 2003 and one for $306 on eBay in 2006. Ferris Wheel. This one sold for $500 in 1995. Floral Spray. 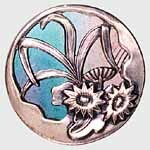 Called Two Flowers at the 1993 auction where is brought $235. 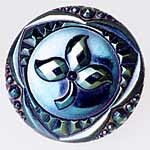 Another, by the name of Floral Spray, sold in 1998 for $125. Flower in Clover. 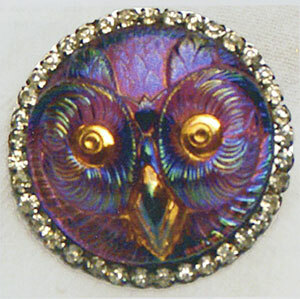 This extraordinary hatpin, in purple and with bright teal iridescense, sold in 2014 for $80. Fuchsia Basket. This is the only one of these I've seen. It sold for $2,100 in 1995. Also known in green. Grape. 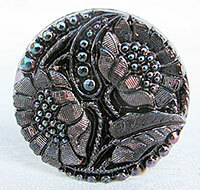 This lavender hatpin is in a private collection. 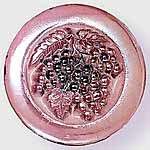 A lavender hatpin called Grape Clusters sold in 2010 for $70. One in green sold for $225 in 2011. Horsefly. The only example reported, it sold for $1,200 in 2003. 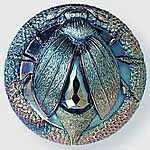 Jeweled Bug. In red, this pin was given this name at the 2003 auction where it brought $650. Laurel Jewel. 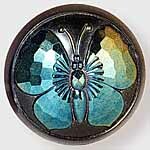 Also a rare hatpin in the collection of Carl and Eunice Booker. Lizard. Owned by Duane and Norma Uusitalo. One of two reportd. Looped Buckle. 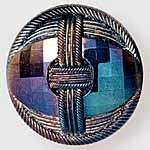 This example sold for $200 at a 2003 auction. Lots of Diamonds. One of these sold for $60 at a 2002 auction. Marvelous. 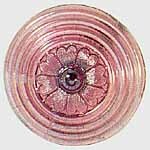 A petal center with a ring of rhinestones. This one sold for $500 in 1995. Metal Framed. 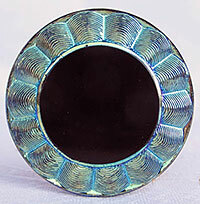 A flat iridized disk with metal design over that. Five similar pieces sold as a lot for $105 each in 1995. In 1998, five others sold for $10 to $25. Nautical. This one had no name when it sold in 1993 for $235. As it has a rope and anchor theme, Nautical was suggested as the name. The color was described as clambroth..
Orchid. Also called Flower and Jewel. One sold in 1994 for $850, another in 1997 for $550. Petal-Eyed Owl. 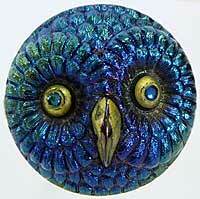 This owl hatpin sold for $1,150 at the 2012 Texas Carnival Glass Club Convention auction. Owl, horned. One of these listed as the only one known sold in 1997 for $1,800. Two more sales of the same name were in 2006 for $850 and 2010 for $625. 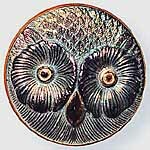 Owl, horned, in metal frame. 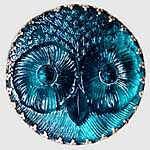 This blue owl is in a metal frame. Photographed while in the collection of the late John Britt. Owl, horned, tufted. 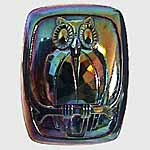 The beak has two sections and extends almost to the bottom of the pin. 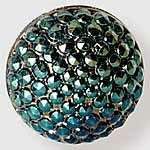 It is surrounded by rhinestones and has a metal back. The eyes and beak are painted gold. Courtesy of Sherry Cyza. Owl, Tiny. 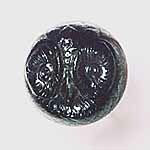 Less than an inch in diameter, this example sold in 1995 for $350. Another brought $110 in 2007. Owl in Window. 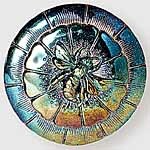 Supposedly a one-of-a-kind piece, this one sold in 2003 for $2,000, but in 2006, a lightly iridized example brought $400. Pegasus. 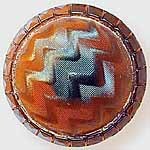 This hatpin sold at a Mickey Reichel auction in 2013 for $220. Pith Helmet. Sold in 2007 for $850. 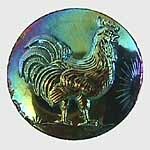 Plumes & Buckle. 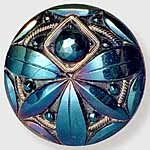 This dark hatpin with blue iridescense was listed as unknown when it sold in 2014, It needed name so Plumes & Buckle was given. It brought $45. Propeller. 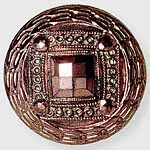 The only example I know of, this pin sold at a 1995 auction for $700. Rectangular Diamonds. From the collection of Carl and Eunice Booker. Ribbon Triangle. There are two shown in the auction database. One sold for $400 in 1996, another for $475 in 2003. Spider. 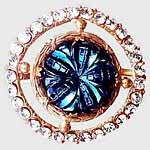 This amber pin sold for $85 in 1993. Ice green sold for $225 and $375 in 1993 and 1994. Marigold for $70 in 1998. Purple for $375 in 1999. 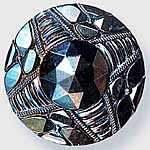 Not all may be iridized. Spider, King. 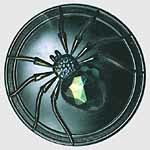 A bit larger than most pins and the spider's legs extend to the edges. One brought $250 in 2007; two more $350 and $400 in 2011. Spinner. 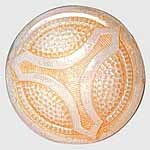 This marigold on milk glass example sold for $175 in 1993. Star and Flower. In blue; the only example reported. This one sold for $1,000 in 1995. Stork. 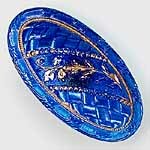 This rare hatpin has the distinction of being the most expensive sold at auction. It brought $2,600 in 1995. Swirling Hearts. 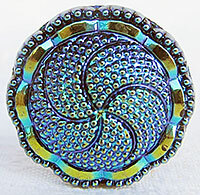 Another hatpin from a 2013 Mickey Reichel auction. It sold for $255. Three Hearts. Sold on eBay in 2005 for $128. 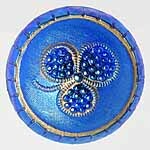 Jeweled Trefoil. 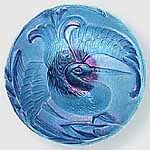 Named by Alphonse Tvaryanas in his 1991 book on Carnival Glass hatpins. 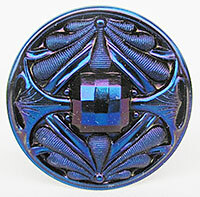 This example sold for $185 at a 2000 auction. 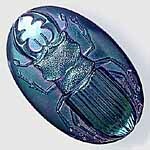 True Scarab. As with most insect hatpins, it's very desirable. 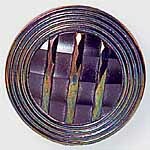 This example sold for $1,000 in 1995, another for $700 in 1997. Twin Gators. In 2006, one brought $600, and in 2008, another sold for $700. In 2012, one sold for $220 and another for $650. Two Sunflowers. 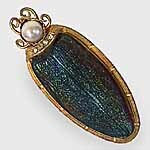 This is what this dark hatpin was named when it sold at auction in 2014. It brought $95. Ugly Bug. 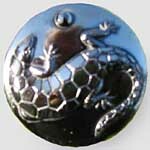 Another very desirable hatpin. This one sold for $1,640 in 1997, another for $1,700 the same year. A third (or one of the others) for $1,200 in 2003. Whirligig. 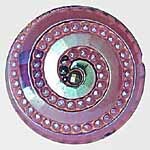 This purple hatpin with multi-color iridescense sold in 2014 for $110. White Rose. 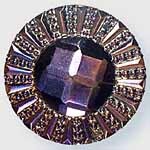 This purple hatpin has clear iridescense. It sold in 2014 for $75. Zig Zag. 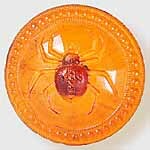 This amber hatpin was photographed while in the collection of the late John Britt. Zodiac. Yet another from a 2013 Mickey Reichel auction. 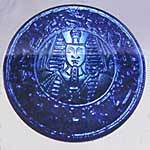 Appears to have an image of a pharoh on it. It brought $210.